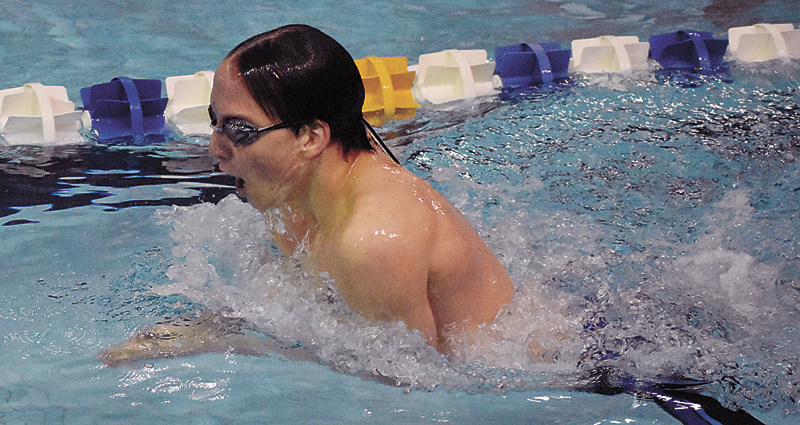 T-R PHOTO BY THORN COMPTON - Marshalltown freshman Marcus Barker, front, competes in the 400-yard freestyle relay during the Bobcats’ home dual against Waukee on Thursday. Barker won the 200 individual medley and MHS fell to the Warriors, 104-66. With No. 2 Waukee coming in to town for the final home meet of the season, the No. 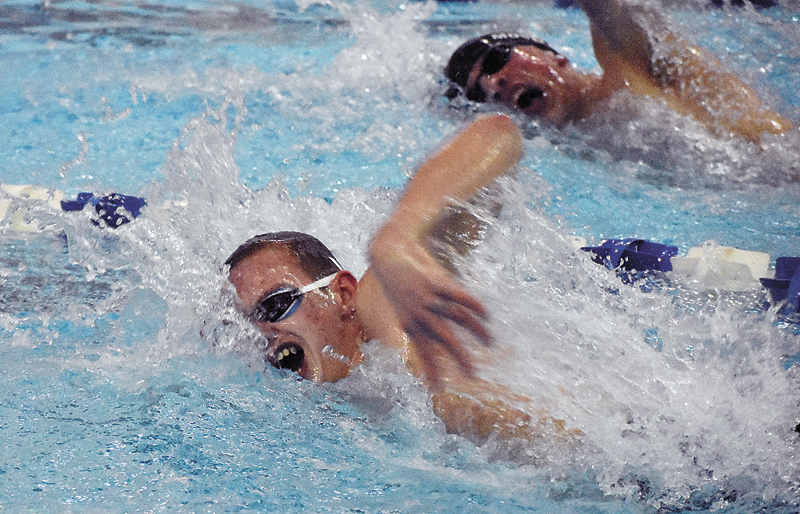 12 Marshalltown boys swimming team knew a total victory was a long shot, but there were still some opportunities to compete well at the MHS pool on Thursday night. The Warriors walked away with a 104-66 victory, but Bobcat boys swimming head coach Mike Loupee said his guys have nothing to hang their heads about. 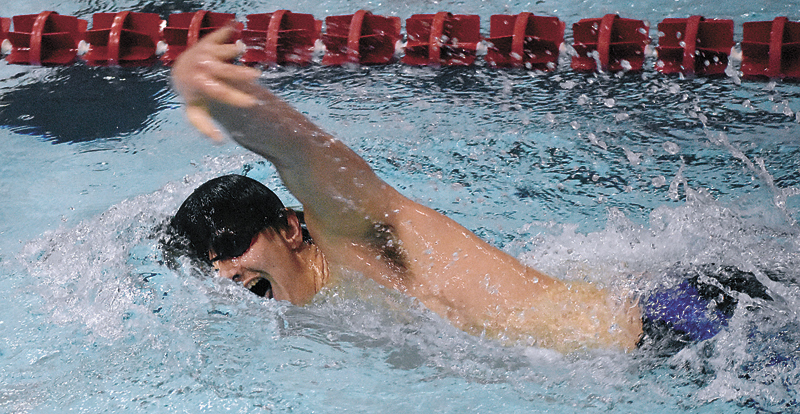 Two of those season bests came from senior Ryne Downey, who showed well in his final performance in his home pool. Downey placed second in both the 50-yard and 100-yard freestyle races, finishing with a season-best 22.32 in the 50 and a season-best 49.99 in the 100. Downey said it was good to finally see his times drop after staying in the same place for the last few weeks. 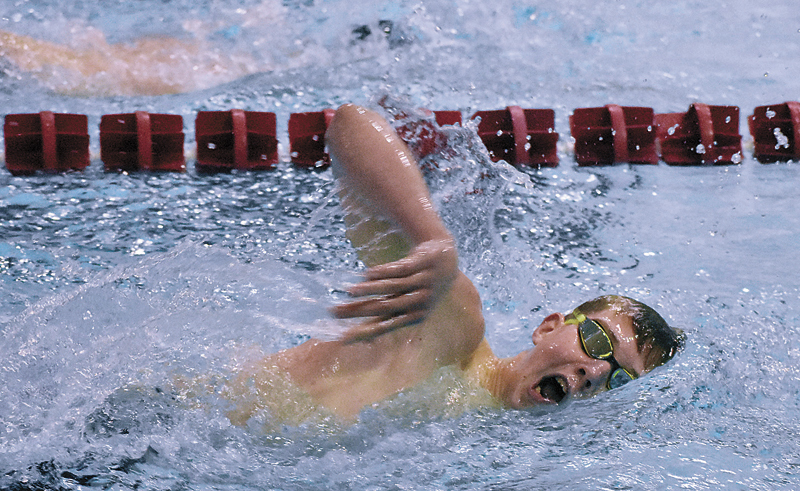 T-R PHOTO BY THORN COMPTON - Marshalltown junior Carson Beals swims in the 200-yard freestyle during the Bobcats’ home dual loss to Waukee on Thursday. Beals won the race with a lifetime best time of 1:50.45. “They were what I was hoping for, that’s what I’ve been shooting for for most of the season and to finally hit it feels really good,” he said. Most of the time, Downey in the 50 freestyle specifically is so far ahead that he is just racing himself, so competing against the tough Warriors was a welcome change. 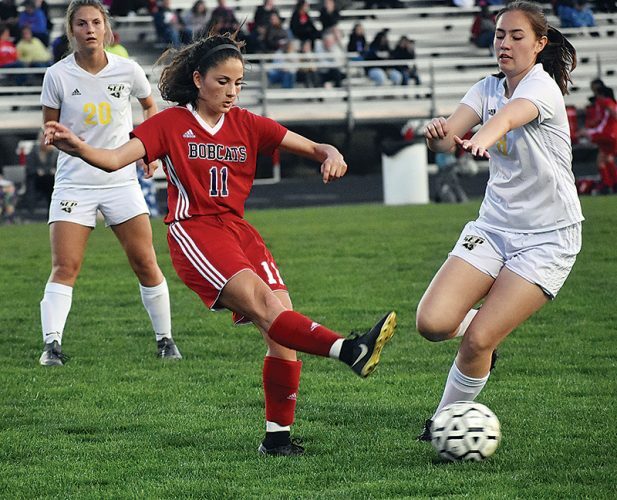 “It’s a lot easier to latch on to someone and try to stay with them as best as you can rather than just swimming against slower people and hoping you are where you need to be,” Downey said. Loupee said it’s been tough for Downey that he wasn’t coming along as well as he would have liked, but the plan has always been to work hard through the meat of the season and see the real time drops near the end. “Ryne has swam well all season and he started out real well, but sprinters get tired. He is under the same high-yardage workload and high-intensity workload as the rest of the team and so he wears down,” Loupee said. “At the beginning of the season he popped some pretty good times, as the yardage and intensity built up he has plateaud but he’s stayed close to those times all year. He was a little slow against Valley and he was a little bit panicked that he wasn’t where we had talked about he should be. T-R PHOTO BY THORN COMPTON - Marshalltown High School senior Ryne Downey swims in the 400-yard freestyle relay during the Bobcats’ 104-66 loss to Waukee at home on Thursday. Downey swam season-best times in the 50 and 100 freestyle races. The Bobcats finished in first in two events on the evening, with junior Carson Beals taking the top spot in the 200 freestyle with a lifetime-best 1:50.45 and freshman Marcus Barker turning in a season-best 2:09.80 in the 200 individual medley to win. “[Beals] took it out very aggressively, in that third 50 it looked like he might get caught but he showed some real determination,” Loupee said. “Carson is a competitor, first and foremost, and he showed some real determination making sure that he was going to hang on and win the race. Bryce Edens also had a great swim and a season-best as well. Aside from Downey’s two second-place finishes, Edens finished in second in the 500 freestyle to go along with a third-place finish in the 200 freestyle, Nash Perisho was second in the 200 individual medley behind Barker, and Blaine Gunderson took silver in the 100 breaststroke. Marshalltown had a good night in the relays as well, with the 200 medley relay of Caleb Summers, Gunderson, Perisho and Barker placing third with a season-best 1:48.54, the 200 freestyle relay of Downey, Barker, Perisho and Beals swimming a season-best 1:31.63 to take second and the 400 freestyle relay of Downey, Barker, Edens and Beals taking second with a 3:25.47. With this being the final home meet of the year, it was also the final time the six seniors — Ryne Downey, Caleb Summers, Blaine Gunderson, Jacob Eberle, David Wahl and Jose Orozco — got to swim at home. Loupee said those six have been amazing to work with for all the years they’ve been out, and especially their senior year. “They are six great personalities. They are super kids, they come from tremendous families and they love to be together in the pool,” Loupee said. “Even when the workload is hard, they find a way to enjoy what they are doing and enjoy each other’s company. As a coach, that’s the kind of senior class that you wish you could have every year. 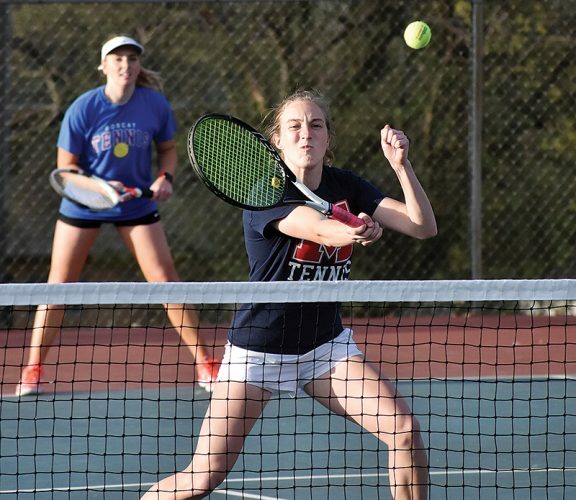 The Bobcats are nearing the end of their journey, as they just have the CIML Iowa Conference meet, which was rescheduled from Saturday to Monday at 4 p.m. in Fort Dodge, and a road dual against Indianola on Tuesday before preparing for the district meet. Loupee said his boys have worked hard all season long, and now it’s almost time to unleash their full potential. 200 MEDLEY RELAY — 1. Waukee A (Linder, Reiter, Pollitt, Kuhlers) 1:43.38, 3. MHS A (Summers, Gunderson, Perisho, Barker) 1:48.45. 200 FREESTYLE — 1. Carson Beals, MHS, 1:50.45; 3. Bryce Edens, MHS, 1:50.7; 5. Tyler Downey, MHS, 2:03.05. 200 INDIVIDUAL MEDLEY — 1. Marcus Barker, MHS, 2:09.80; 2. Nash Perisho, MHS, 2:10.59; 5. Blaine Gunderson, MHS, 2:21.77. 50 FREESTYLE — 1. Michell Pollitt, Waukee, 22.07; 2. Ryne Downey, MHS, 22.32; 5. Ethan Benscoter, MHS, 24.62. 100 BUTTERFLY — 1. Cameron Linder, Waukee, 55.48; 3. Nash Perisho, MHS, 58.39; 4. Caleb Summers, MHS, 58.45. 100 FREESTYLE — 1. Mitchell Pollitt, Waukee, 49.27; 2. Ryne Downey, MHS, 49.99; 4. Carson Beals, MHS, 50.68. 500 FREESTYLE — 1. Drew Reiter, Waukee, 5:01.11; 2. Bryce Edens, MHS, 5:05.19; 3. Tyler Downey, MHS, 5:33.27; 4. Ethan Benscoter, MHS, 5:33.63. 200 FREESTYLE RELAY — 1. Waukee A (Muenzenmay, Patterson, Waltman, Kuhlers) 1:31.52. 2. MHS A (Downey, Barker, Perisho, Beals) 1:31.63, 3. MHS B (Edens, Seberger, Downey, Benscoter) 1:38.66. 100 BACKSTROKE — 1. Drew Reiter, Waukee, 57.26; 4. Jacob Eberle, MHS, 1:04.68; 5. Aaron Seberger, MHS, 1:05.00. 100 BREASTSTROKE — 1. Cameron Linder, Waukee, 1:01.14; 2. Blaine Gunderson, MHS, 1:07.86; 5. Brock Keeler, MHS, 1:14.28. 400 FREESTYLE RELAY — 1. Waukee A (Linder, Moseley, Reiter, Pollitt) 3:21.03, 2. MHS A (Downey, Barker, Edens, Beals) 3:25.47. T-R PHOTO BY THORN COMPTON – Marshalltown junior Carson Beals swims in the 200-yard freestyle during the Bobcats’ home dual loss to Waukee on Thursday. Beals won the race with a lifetime best time of 1:50.45. 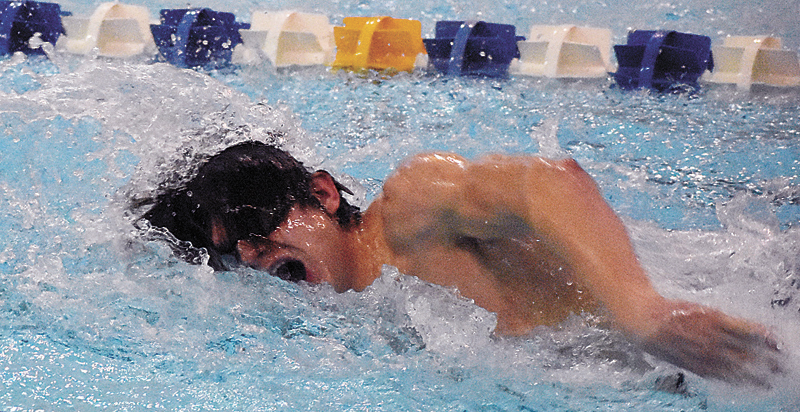 T-R PHOTO BY THORN COMPTON – Marshalltown freshman Marcus Barker, front, competes in the 400-yard freestyle relay during the Bobcats’ home dual against Waukee on Thursday. Barker won the 200 individual medley and MHS fell to the Warriors, 104-66. T-R PHOTO BY THORN COMPTON – Marshalltown High School senior Ryne Downey swims in the 400-yard freestyle relay during the Bobcats’ 104-66 loss to Waukee at home on Thursday. Downey swam season-best times in the 50 and 100 freestyle races.